I seem to be hitting up *lavinyeta about twice a year these days to check in and see how things are going. After my first visit in 2007, things have grown a great deal. From something like six hectares they had in production three years ago, they are up to 24 now out of a potential 40. As I noted in my second visit, this has changed the structure of the Heus Negre and Llavors a good deal with these other vines now able to be used. It also bodes well for Josep and company as his wines have grown in popularity a great deal. The 2006 Puntiapart was the official wine for a very important EU cultural festival which naturally made not only the 06 vintage sell out, but also the first bottling of the 2007 vintage. Not bad for a 12€ wine, which is considered highly-priced in a country where 3€ buys you a great wine. Oh yeah, the label of the 2007 Llavors won a design award for its weather report/newsprint label that was quite cool. This trip, I took my brother in-law with me who is rather new to the whole wine tasting thing, but growing to appreciate it. At first he wasn’t too sure about tasting directly from the tanks given that that is how one gets bulk wine in these parts and it is not a method for drinking high quality wines. He expressed further doubts when we moved through the wines to a side by side comparison of four different Garnatxas that were going in to the Llavors and Puntiapart. Surely the differences would be minimal? Was it really worth the time to taste all these different fields of wine even though they’re the same grape? I mean, two of the tanks are from the same field albeit one from a lower field terrace than the other. From my experience in the Dingač region of Pelješac in Croatia, I learned that just the slightest change in angle of a field makes a considerable difference to the end result of the grapes. Suffice to say, my brother in-law was really surprised. Out of all of these, the most interesting where the two tanks that were from the same field at different terrace levels. The sun is the same, but the earth is just slightly different for the two and it resulted in one with a strong body and little nose and the other with all the nose, richer finish, but little body. 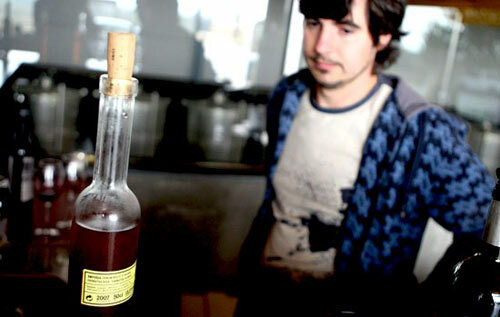 For a winemaker like Josep, this must be heavenly to mix those two and get something golden in the end. The end result of this trip is that I vote for the Llavors at the moment as an immediate purchase. At 7€ it’s a screaming deal and is a luscious ‘gift to the world’ as I told an abashed Josep. The body is strong but smooth. There are slight chocolate undertones to it. The fruit stays back while letting their flavors trickle out slowly with drinking. It’s a reserved, yet strong wine that I assume is best had now or in a year or two is for some reason you feel like aging it. Great with a meal or great on its own. Don’t get me wrong though as the Puntiapart is still the better of the two wines, but at 12€ it’s a bit more costly. If you can afford it in large amounts, go for it. It’s much more complex wine overall and is something that I assume will age well with the body get more pronounced in a year or so. I appreciate the fact that Josep could cash in on the fame of this wine at the moment and pump out the next vintage for people to buy, but he doesn’t and is holding back the amounts that require more aging. Really, you can’t go wrong with anything out of lavinyeta including the forthcoming sweet wine that is yet to be bottled for consumption despite the photo below. Such a difference three years have made from only being able to find lavinyeta wines at his parent’s meat shops around the area to now having them available anywhere, including the United States soon as they now have an importer for the East Coast of the country.